This image shows daytime (left) and nighttime lunar temperatures in Kelvin recorded by the Diviner instrument on NASA's Lunar Reconnaissance Orbiter in new images released Sept. 17, 2009. The coldest place in the solar system might be closer tohome than we thought. New data from NASA's LunarReconnaissance Orbiter (LRO) suggests that permanently shadowed craters atthe moon's south pole might be colder even than Pluto and the other objects inthe solar system's furthest most reaches. In its firstset of measurements, announced Thursday, LRO's Diviner Lunar RadiometerExperiment, which is conducting the first global survey of the temperature ofthe lunar surface, found that craters along the lunar south pole that haveareas permanently shielded from the sun's light (and suspected to harbordeposits of water ice) have extremely cold temperatures. "Diviner has recorded minimum daytime brightnesstemperatures in portions of these craters of less than -397 degreesFahrenheit," said David Paige, Diviner's principal investigator and a UCLAprofessor of planetary science. "These super-cold brightness temperaturesare, to our knowledge, among the lowest that have been measured anywhere in thesolar system, including the surface of Pluto." While it may seem odd that the moon, which is much closer tothe sun, could be colder than Pluto, it's not at all unexpected, one planetaryscientist said. In fact, the poles of Mercury may be even colder. "The key point is not their distance from the sun, butthe fact that there are regions at the poles of the Moon and Mercury that neversee the sun, and so never get heated by sunlight," said Alan Boss, of theCarnegie Institution in Washington, D.C.
"The only heat they receive is from the underlyingrock, but that means only interior heat leftover from their formation or theirinternal radioactive decays, but in any case the local rocks are still coldbecause they too are free to radiate out to -263 Celsius space without gettingany heat back from the sun," Boss told SPACE.com. The news of these frigid temperatures bolsters the idea thatthese craters could harbor water ice, which would be a boon to any future moonbases, which could melt the water and use it for drinking, or extract hydrogenfor fuel. The ultra-low temperatures of these craters are the oppositeof those at the lunar equator, which are hotter than the boiling point of waterat noontime. 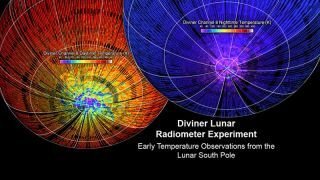 Lunar surface temperatures are expected to change with theseasons, and Diviner will continue to monitor and map them throughout LRO'splanned one-year mission. LRO was launched on June 18, along with its companion, the LunarCrater Observation and Sensing Satellite (LCROSS). LCROSS willimpact one of these lunar craters, Cabeus A, on Oct. 9 to generate debristhat can be analyzed for signs of water.